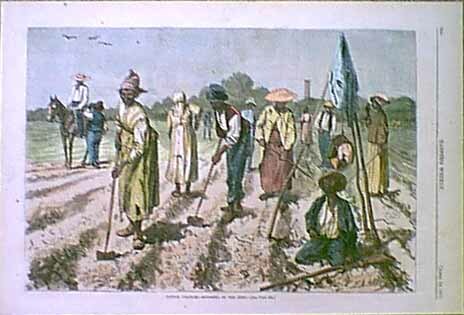 Revisited Myth #26: Hoe cakes took their name from slaves using hoes to cook their cornmeal in the field. I clarified this back in 2010, saying that this was the actual origin of the term “hoe cake.” That turned out to be a mistake, one that Rod Cofield, director of Historic London Town, MD, pointed out. I revised the post then, and will summarize here. First, a hoe cake is cornbread fried in fat and cooked over a fire. (That doesn’t mean fires were kept burning in the fields, however.) Fields were often located far from the slave quarters and rather than trudge back for the noon meal, it must often have been easier to build a small fire at the edge of a field, cook some cornbread, and find a piece of shade to rest and eat. Hoes were flat iron tools and could easily double as a griddle. According to the Oxford English Dictionary, the term hoe cake first appears in printed form in 1745. Washington Irving mentions hoe cakes at least twice in his satirical History of New-York (1809): Philip Vickers Fithian mentions it in his journals from the 1770s; and British soldier in the 1770s refers to cornbread: “Negroes bake it on hoes that they work with.” WIth that evidence, I thought I was on solid ground in saying that this was the origin of the term. Nope. Yes, enslaved laborers (and white laborers too, no doubt) did cook cornmeal on agricultural hoes, but that isn’t the origin of the word hoe cake. With Rod’s permission, I’m directing you to his impeccably researched and documented article, “How the Hoe Cake (Most Likely) Got Its Name.” It was published in 2008 in Food History News. It even has illustrations! It’s long, but it’s worth every minute. If I sound impressed, it’s because I am. This entry was posted on Sunday, September 14th, 2014 at 2:09 pm and is filed under African-American history, Food & Beverages. You can follow any responses to this entry through the RSS 2.0 feed. You can leave a response, or trackback from your own site. 2 Responses to Revisited Myth #26: Hoe cakes took their name from slaves using hoes to cook their cornmeal in the field. Just want to tell you how much I appreciate your research. Thanks for your hard work. Congratulations on your first book! A new book is always exciting but your first, well, that’s even more special.